All it takes is one step through the door and a greeting from John and Kathy Lundberg to realize that Big Horn Trading is unlike any other store in Sheridan. In a world filled with sometimes overpowering consumer culture, everyone has had an experience in which it feels like you are nothing more to a business than a simple transaction, but Big Horn Trading is more than simply a place for transactions – it is filled with the warm exchange of knowledge, shared principles and, well, some great products too. More than anything, Big Horn Trading is based on the two things that are most fulfilling for John: helping people fulfill their specific needs, and being able to share a lifelong passion for firearms and the discipline of marksmanship. The merger of these two items is ultimately what drove Big Horn Trading to become Sheridan’s only Class III firearms dealer. With his lifelong interest in firearms, John had personal experience with the benefits of owning sound suppressors – both for hearing protection and as a marksmanship training tool. 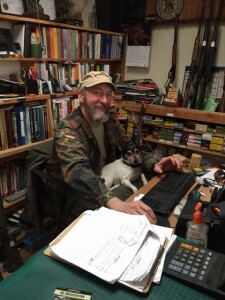 John recognized that having a store with a Class III firearms license would be an opportunity to channel his own passion into filling a niche in the community for other people with similar enthusiasm for firearms. John’s previous 13 years of experience as a pawn broker also highlighted the need to fill another slot in the community for a quality pawn shop in the heart of Sheridan’s downtown. Big Horn Trading enjoys a good rate of return on pawns, and takes pride that their pawn services are able to help folks weather a rough patch and then get their pawn back at the end of the day. Speaking with John quickly shows that, unlike many of the folks in the firearms section at other stores, he isn’t just filling a spot at the counter. As both an NRA certified pistol instructor and a Project Appleseed instructor, he provides customers with a depth of experience regarding both the actual firearms and marksmanship. For John, speaking with people is an educational opportunity to help identify their true needs and find the perfect tool for the job. As he often shares with people, when it comes to firearms it’s more important to be accurate than big. As soon as you walk in the door at Big Horn Trading, one of the first things you’ll notice is the selection of books. Big Horn Trading proudly carries books that fit with Big Horn Trading’s principles on subjects like citizen’s rights, individual liberty, survival skills (including the Patriots novel series by Survival Blog author James Wesley, Rawles), how to build a bug-out bag, and more. It’s clear from these books and conversations with John and Kathy that these principles are not just book themes – they are a core part of what inspires the business. 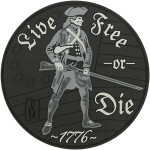 John has a breadth of knowledge on various survival and preparedness skills, and it’s clear from products like the “Live Free or Die” morale patch where Big Horn Trading’s principles lie. These principles create a strong undercurrent in the store that is apparent to anyone who shares them, and truly sets Big Horn Trading apart from other stores in Sheridan.